Cheng Ran presents a solo exhibition In Course Of The Miraculous at Galerie Urs Meile Beijing. The exhibition features a series of works made during the artist’s two year residency programme at The Royal Academy of Visual Arts in Amsterdam. For the exhibition, Cheng has produced works in a variety of media from texts, video works and installations. The title of the exhibition is derived from Dutch artist Bas Jan Ader’s famous performance piece In Search Of The Miraculous from the 1970s, and the exhibition considers the coexistence of real and false to open up an ‘exploration’ of this thematic practice. For Cheng, it is also a bold, experimental attempt to ‘explore’ the language of film and the aesthetics of the shot. Cheng’s primary medium is video, and he has often parodied, distorted and reinterpreted the classical, but more recently, his interests have extended to other media such as objets trouvés and sound performances. In Course Of The Miraculous features an ‘unfinished’ film without narratives, showing the artist’s preparations, the right and wrong assumptions made while shooting the film, and the changes that happened along the way in his ideas and practice. As the central part of the ongoing 9-Hour Film project (working title), Storyboard Film borrows the cinematic technique of story-boarding: showing planned and altered shots, combined with the sound of murmuring. Together they form an abstract film of non-existent images, and from this perspective, Storyboard Film is like a secret channel drawing the audience into imagining a film, and its enormous and rich narrative possibilities. 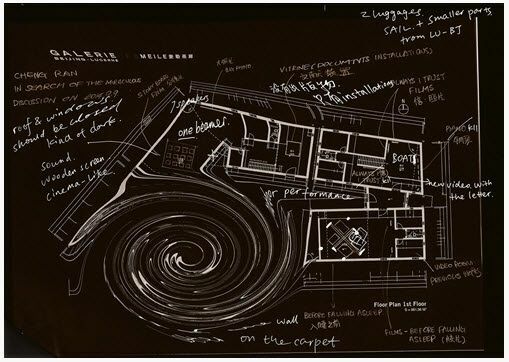 Cheng has also specially designed a viewing space that evokes a cinematic feeling, which importantly allows him an exploration of time, space and the relationship with the audience. 9-Hour Film project (working title) is supported by K11 Art Foundation, and when the film is finished, it will premiere in Europe at the Istanbul Biennial in September 2015. Cheng also presents a sailboat installation that was exhibited at the RijksakademieOPEN in Amsterdam, the Netherlands in December 2014. It has been rebuilt under specially arranged film lighting. Also, constituting fragmentary clues about this mysterious film, large-format light box photography, numerous objets trouvés, manuscripts and props are displayed as well. The large four-screen video Before Falling Asleep (2013) was shot and produced in the Netherlands. This artwork was inspired by classic bedtime fairytales; the four parts were adapted from Aesop’s fables and Ivan Krylov’s stories of the same title. By anthropomorphizing the characters in the tales, conversations between the pond and the river, two pigeons, the fire and the tree, as well as the butterfly and the flower, touch on progress and stagnation, truth or lies, choosing or missing, and being far away or at home. Cheng Ran is most interested in the narrative technique of using objects as metaphors, or using objects to express an aspiration, and the boundary between dreams and reality that cannot be expressed, as well as the overlap between the ideas in the stories and that state of trance occurring moments before falling asleep, when a child is between real life and dreamland. In terms of the design of the space, the collage carpet pieces with text provide more possibilities and metaphors on the space, story and language: it echoes from afar his solo exhibition of the same name, The Last Generation, which was based on a novel and presented at Galerie Urs Meile Beijing in 2013. In Course Of The Miraculous is on at Galerie Urs Meile Beijing from 25 April - 12 July 2015.